After the engagement bash, Nick Jonas left for the US along with his family. It is speculated that Priyanka and Nick can tie the knot on September 16.
International diva Priyanka Chopra recently announced her engagement to American singer Nick Jonas in a star-studded bash. Priyanka’s Bollywood friends including Alia Bhatt, Salman Khan’s sister Arpita Khan Sharma, Aayush Sharma, Siddharth Roy Kapur, Sanjay Leela Bhansali, her cousin sister Parineeti Chopra, business tycoon Mukesh Ambani with wife Nita Ambani and daughter Isha Ambani and others geaced the event. Ahead of the grand engagement bash, a traditional roka ceremony was held in Mumbai. Both Priyanka and Nick looked stunning in the traditional attire at the occasion. Priyanka wore yellow salwar suit while Nick donned off-white kurta pyjama for the roka ceremony. Soon after the engagement bash, Priyanka and Nick went to an orphanage in Mumbai. The couple was seen dancing, singing and enjoying with kids at the orphanage. A video of Priyanka in which she can be seen dancing with kids went viral on the internet. 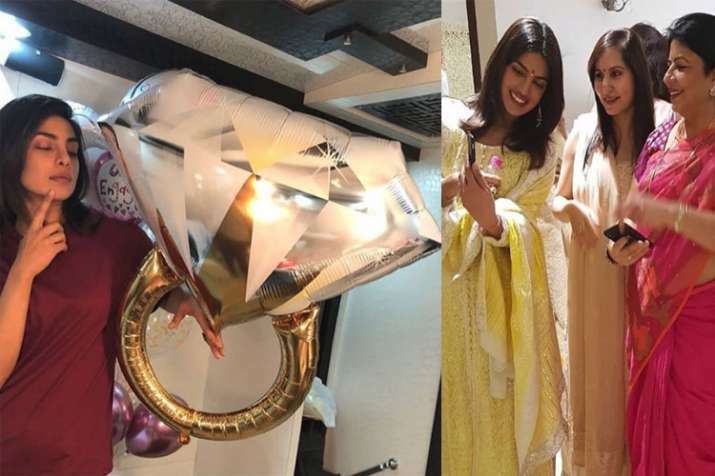 Priyanka’s engagement became the talk of the town due to multiple reasons. Not just the Nick’s ethnic attire and Priyanka’s bracelet but their engagement cake turned heads of many. As per the reports, Priyanka and Nick’s engagement cake was decorated with 24 carat gold leaves, which made it a unique one. Also Read: Priyanka Chopra and Nick Jonas' engagement cake doing rounds on internet. But why? After the engagement, Nick left for the US along with his family. It is speculated that Priyanka and Nick can tie the knot on September 16.